Michael Lewis’ book “Moneyball” was published in 2003. For years afterwards Joe Morgan, ESPN’s leading baseball color commentator, repeatedly insisted that the book had been written by Billy Beane. This is absolutely nonsensical. But now that “Moneyball” has made it to the big screen, Morgan’s nonsense be a tiny bit less ridiculous: this is most definitely now the Billy Beane story. Can a person be a success if he is not the best? The book painted a detailed picture of the lineage of the then state-of-the-art in the analysis of baseball players through the lens of the 2002 Oakland A’s and their general manager Billy Beane (Brad Pitt). Bennett Miller’s movie condenses the story of the gradual revolution in analysis into an adapted story of that one season, using it as the backdrop to its relaxed portrait of a man driven by hatred of losing. To get away with this, the film stereotypes the peripheral baseball figures around Beane in a way that the book was careful not to, but I had no problem there. 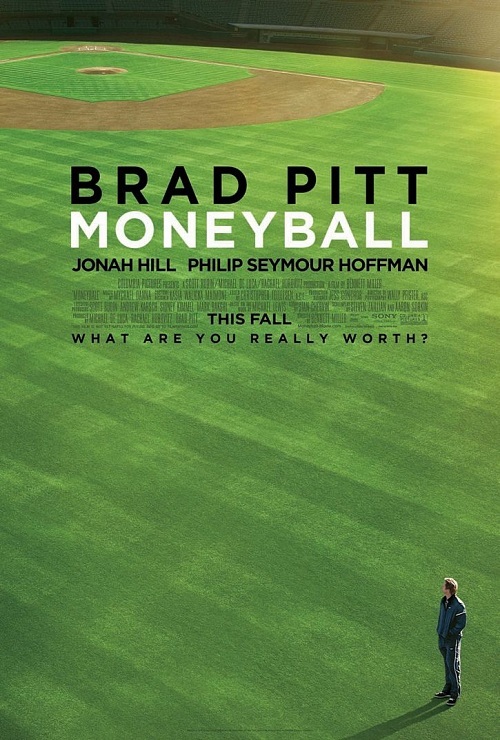 Who needs fidelity from a baseball movie, let alone one about player valuation? This goes also for the liberties taken in illustrating the 2002 A’s without so much as mentioning their MVP shortstop or three elite starting pitchers. So be it. Instead we are left with the character of Beane, composed entirely of his relationships to baseball and his young daughter Casey (Kerris Dorsey). We first see him sitting alone in stands of the dark Oakland Coliseum as his team, on the other side of the country in Yankee stadium, loses in the first round of the 2001 playoffs. He cannot even stand to listen to the radio he is holding, flicking it on and off. He is drained by defeat, but he is not there to witness it. It is the endpoint of success or failure that affects him, not the way it is earned. “We lost”, he says repeatedly, refusing any consolation. His challenge then is to rebuild the team after this disappointment – and the loss of several key players to other teams and the big-money contracts he and his A’s cannot afford. Pitt plays Beane almost manically, in his drive to win at one moment cool and focused and the next shooting from the hip. He senses that he cannot replace his lost stars in any straightforward sense of the word. He notices and then poaches a young analyst, Peter Brand (Jonah Hill), from a rival team’s administration, elevating the data-cruncher to be his right-hand man. Together they forge a plan to punch above their weight, to find value in the darkest corners that richer teams can afford to overlook. Brand has little obvious motivation other than his correct conviction that the conventional wisdom is wrong; Beane’s motivation is enough for two men. Pitt’s relationship with Jonah Hill occasionally recalls that with Ed Norton from “Fight Club”, as Beane mentors Brand by challenging and wrong-footing him. But Brand talks back. Through their discussions we see that Beane is credulous and does not struggle against what, to the old-school baseball lifers that compose his staff, is sacrilege. Eventually he even descends to explain himself to his players, teaching his misfits how they can achieve the success that Brand has convinced him they can attain. Still he will not watch the games, but neither is he sitting alone in an empty stadium. He is now intervening in fate. Beane’s tragedy throughout is that he cannot conceive of exceeding expectations as success. It’s not enough for his team to do better than they “should”, given their resources. The point is driven home by interspersed scenes of the young Beane, a supposed sure-fire baseball star, not the underdog but the favorite. He flames out, fails, and there is no space for him between this failure and that. Later, Brand tries to demonstrate to Beane that progress, and beating the odds, is not failure, at worst a different kind of success; Beane seems to concede in principle without quite agreeing. It is another story entirely with his daughter. Baseball consumes the vast bulk of the screen time, but in a sense Beane’s most important relationship in the film is with his Casey. He takes her to buy a guitar. She plays well and he asks her to sing too, but she is reluctant – she’s not very good, she claims. But now it doesn’t matter to him. He convinces her to sing, and she is good, better than we could expect, and Beane is speechless and proud. Suddenly the question of who is the best singer doesn’t matter; Casey is good, and Beane cares about Casey. Pitt’s performance is too subtle and the film as a whole too patient for melodrama or triteness. Yet by the coda when Beane is invited to ascend to the throne as general manager to the Red Sox, to suddenly have a buffer of the resources as well as the drive to win, it seems that more than just being close to his family or a perverse desire to be the underdog drives him to decline. Perhaps Beane, without ever quite admitting it, is now willing to admit that different kind of success.